More thoughts on the game's story. Spoilers for the first half of Battlefront 2's campaign follow. When did five or six hours become the target length for a shooter campaign? I think it was during the journey from Call of Duty 2 to Modern Warfare and then Modern Warfare 2. According to one of my favourite utility sites, How Long To Beat, COD 2 took an average of 8.5 hours to beat. COD 4 took seven hours. Modern Warfare 2 took 6.5, and the series has lingered there ever since. For the most part, other developers followed its lead. The campaigns in shooters like the original Homefront, Battlefield 1 and Titanfall 2 range from 4.5 to six hours in length. If singleplayer is still a big part of why you enjoy playing FPS games, then it's hard to justify spending £50/$60 for six hours. Star Wars Battlefront 2's campaign took me around five or six hours to finish, and the people on How Long To Beat say they've done it in 4.5. If I was a Star Wars fan, buying this game mainly for the promise of EA's first big budget story with the licence (TOR aside)—and those people are bound to exist, given the wide audience that loves these movies—I'd be a little disappointed. Time spent doesn't necessarily equal value in games, but if something feels short, you can't help noticing it as a player. Protagonist Iden Versio is in the centre of the box art for Battlefront 2. While she features in the game's multiplayer, a fairly big deal was made of the fact that Battlefront 2 has a campaign starring an Imperial character, but what's here feels like the shortest offering they could possibly get away with. If the approach is supposed to be 'short but sweet', I think that only works when your action beats are consistently of a top-tier quality. Battlefront 2 definitely has a few moments like that, but no single level that I'll be talking about in our end-of-year list like I was with Lazarus Labs in Doom last year, or indeed older examples like the moon in Wolfenstein: The New Order or COD4's All Ghillied Up. There's still a lot to enjoy in those few hours, though. Sprinting across the top of an Endor base as your squad escapes in separate TIE Fighters is exhilarating, and one world occupied by giant aliens is weird in the best possible way. I enjoyed almost all of the spaceship sequences, even if they're largely simple shooting galleries. The missions where you take on the roles of familiar characters are mostly good, even if a couple of the soundalikes are miles off—plus, hitting a hundred bugs as Luke Skywalker while another guy slowly activates a door doesn't feel very Star Wars to me. The dialogue is sharp throughout, and I like that the focus is primarily on new characters. I haven't enjoyed Marvel's Star Wars comics because they're almost all awkwardly trying to say new things about characters whose stories have been told, in timeframes where no new developments need to exist. Like Greg Rucka's enjoyable Shattered Empire, this tells a neat tale set between Episode VI and VII, a part of the timeline I don't feel like I know loads about. Even when iconic movie characters pop up, they ring true in the writing, and that must be hard to pull off. I love the dialogue, then, and wish there was more of it to enjoy, but the story itself leaves something to be desired. I think that's because it doesn't really deliver on the idea of a tale told from the Imperial point of view, nor do you learn enough about Iden herself. I can't believe I'm saying this in the year 2017, but I think this game needs more cutscenes. In a post on the making of Battlefront 2 from yesterday, Lucasfilm Story Group's Steve Blank said this about the game's writing team: "They said, 'Hey, we are really interested in a Imperial point of view in general, but one of the times we find really fascinating is the time period spanning between Return of the Jedi through The Force Awakens. It hasn’t been explored a ton yet. We have seen some novels, not a lot of details outside of that. There are these major events, like the destruction of the Death Star II—what would that have looked like from an Imperial point of view? And so, we want to figure out with you guys, can we tell a story there?" The thing is, though, you only really get the Empire's perspective for the prologue and first four missions of Battlefront 2. 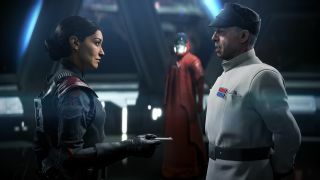 For the remaining eight, Iden Versio and her comrade, Del, basically join the Rebellion, and most of the tension is removed from the story. In the opening, you get the sense that Iden and company believe in the sense of order that the Empire brings—but their perspective isn't explored with much greater depth than that. When they turn against the Empire, as the Empire turns on its own people, they make the snap decision to change sides with very little ambiguity. I feel like I'd have bought into it if I'd spent more time with Inferno Squadron first, getting to know the characters, and saw their viewpoints gradually diverge. Instead, everything happens too fast. The biggest twist happens too early, and the campaign isn't long enough to convey a real sense of journey. You're not really getting the Empire's point of view, then, so much as some Rebels who are a bit regretful about their past deeds. And I don't think that's how the campaign was originally pitched. "So we were interested in looking at, what’s the grey side of the bad?" Lucasfilm's Douglas Reilly told me earlier this year. "And that comes from a place of—when you take off that stormtrooper helmet—who is that person underneath? Why do they believe what they believe? Why do they feel the Empire is the right place to be? We wanted to explore what that meant to an individual who was truly committed and raised in the Empire, and absolutely fully believes in that. To her, and to the Empire, she is a hero." I don't think the game tells that story. "We'll see her grow but maintain her commitment in her beliefs across that period of time," Motive's Paola Jouyaux told me about Iden's journey through the game at Celebration earlier this year. Considering she switches sides less than halfway into the story with no intention of turning back, that's not the case either. Perhaps they changed course, or maybe they just didn't want to give too much away, which I'd understand. Either way, though, I think the game offers the safest possible version of the Empire's point of view. Maybe I've been spoiled by TIE Fighter? I came out of Battlefront 2's campaign not wanting to jump into the multiplayer, then, but to see these characters' stories develop further. There's a new mission with Iden coming up very soon, which is a nice downloadable extra, but I'd rather play a longer campaign that realises the full potential of the premise. While Battlefront 2's release has become a torrid story about loot crates, this is still the part of the game I'm most interested in.